So it's the end of week two of Squaduary, and things are progressing nicely! Although I'm struggling to believe that we're half way through February already. Who says you can't have both claws AND guns?? I've finished painting one of my Kataphron Destroyers and have made good progress in painting the other two. I've very much enjoyed painting these models from Wargame Exclusive and they have made a nice change from the Games Workshop version. Glad I increased the base size. I've continued with the green and brass colour scheme common to the rest of my Adeptus Mechanicus forces. 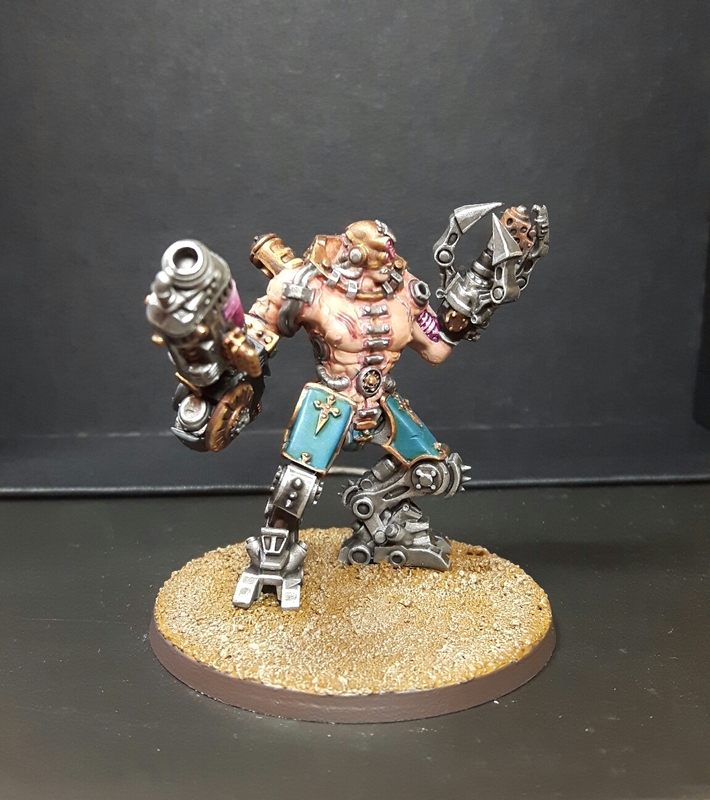 These models however have a lot more bare flesh than the usual Mechanicus range, so some different colours were called for. The skin was basecoated with Rakarth Flesh before following up with thin layers of Cadian Flesh (pretty sure this is from the old Citadel colour palette). Then I washed the recesses with a little Reikland Fleshshade and some Carroburg Crimson to make the implants look sore and poorly maintained. 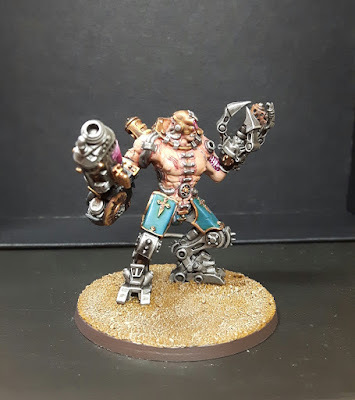 Finally I highlighted up with a mix of Screaming Skull (old palette again) and Cadian Flesh. Overall, I'm pretty pleased with how it turned out. Skin tones are something I tend to agonise over but this time I tried to paint a bit more fast and loose and I think it turned out fine. The back is nicely detailed too. I also tried to paint the raised veins in kind of a blue colour. I'm not 100% happy with the effect, but I don't think it detracts from the models. So, that's another step towards the completion of the squad. 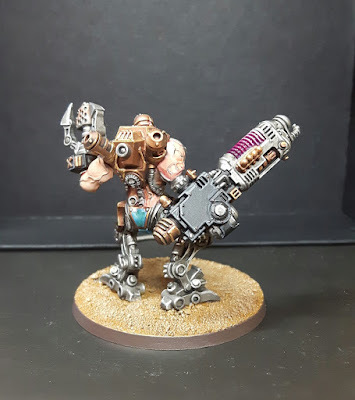 Join me for next week's post when hopefully I will have another completed model to share. If you'd like to read my previous Squaduary posts you can find them here and here. Looking good. I need to post up another update soon! I like the way the veins came out. The one on his chest looks particularly good. As usual, cool plasma coil bits. I'm still not totally happy with the veins. I think they are coming together better on the rest of the squad. 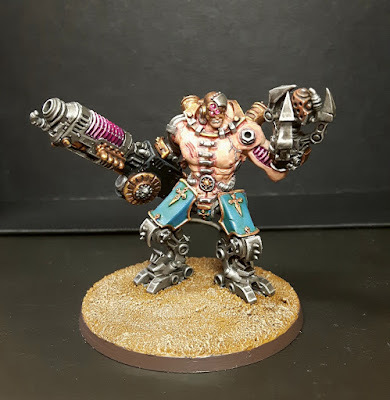 I love the model and you sir have done an amazing job with the painting! well done! I hope you're proud of the results! you should be! Thanks a lot, that is high praise indeed! I'm pretty happy with the squad so far. You have certainly set yourself a challenge with all those guardsmen! The veins are creepy and subtle. Well played. Thanks Rory, that certainly makes me feel a whole lot better about them!